If your team is like mine, it can sometimes feel like they’re speaking a language of their own creation. Everything from project names to database columns has their own — often non-intuitive — definitions. And when your team doesn’t know the language, miscommunications and misunderstandings are guaranteed. I’ve created an app called Wonderus to solve that problem. It can serve as an acronym and jargon decoder and works especially well with Slack. So if you’re already using Slack for team communication, read on for how to quickly create an acronym decoder for your team in just a few minutes. And even if you’re not using Slack, never fear, stick around for the bonus step for info on how to use Wonderus with your team! To get started you’ll need to create an account on Wonderus. I know, I know — another account. The good news is that, if you’re using Slack, only you will need an account and your entire team will be able to benefit from Wonderus. Also, it’s free! Once you’re logged in, you can select CREATE TEAM to set up your team on Wonderus. 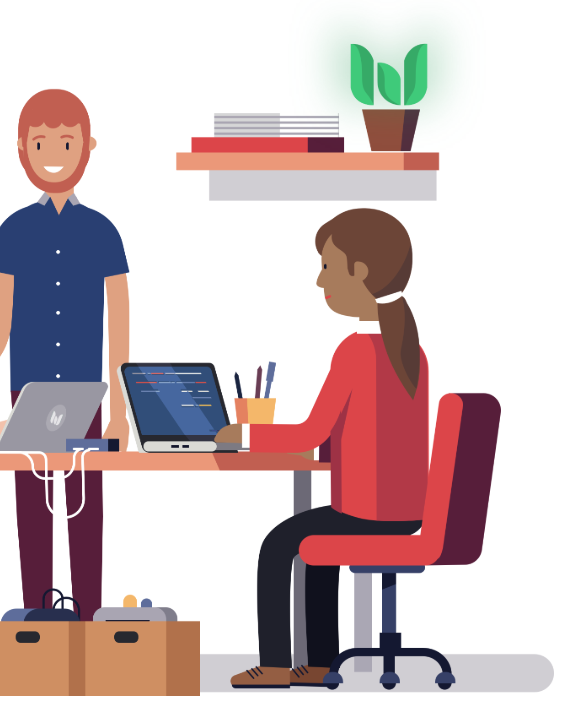 Your team could match your Slack team’s name, as you’ll be connecting this team directly to Slack. Before you connect to Slack, create a few Knowledge Cards on your Wonderus team. We recommend creating one Knowledge Card for each distinct concept, acronym, or term. If your team already has a glossary stashed away in a document, that’s a great place to start. If not, ask a new team member what terms they’ve had trouble deciphering. Select CREATE A CARD to open the Card Editor. You should name your card, add shorthand (such as the commonly-used acronym), and include a short definition. You can reference existing cards or easily create new ones as you go by using the @ sign while you type. Don’t forget to add any acronyms or shorthand underneath the knowledge card title! Create a few cards to get started, but no need for this to be comprehensive yet. You’ll be able to update your knowledge base with more cards at any time. If you’re one of the eight million people using Slack for work every day, it’s a no-brainer to bring your team’s knowledge on Wonderus into your Slack team. From your Wonderus homepage, you’ll see a button to Add Wonderus to Slack. Select that, and you’ll confirm with Slack that you want to install Wonderus to your workspace. NOTE: Some Slack teams have different permissions around who can install Sack apps — you may have to reach out to your Slack admins for help installing Wonderus. 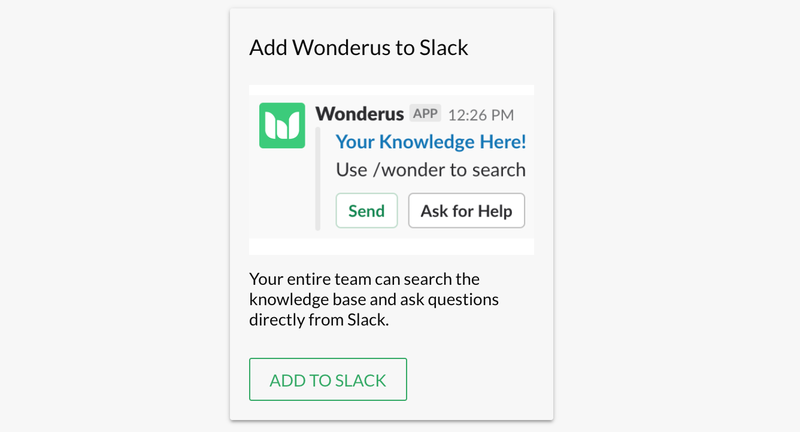 Once you’ve added Wonderus to Slack, your team will be able to search for Knowledge Cards by name or shorthand by using /wonder. If your team doesn’t find exactly what they’re looking for, they can Ask A Question and you’ll get a notification to help. Lastly, you can also create new cards from existing messages by selecting the Create Card action. What it looks like when you use the /wonder command to search for a Knowledge Card! If the world was perfect, your team would immediately start using Wonderus to look up jargon that they don’t know. We all know that’s never how it goes. You can also model good behavior for the team. If you or someone else uses team-specific jargon, consider demonstrating Wonderus in action. An example of when you might want to remind your team about Wonderus. Once your teammates start using Wonderus, they may start to wonder how they ever got by without it. Now everyone on Slack will be able to use Wonderus! But what if you want other people to contribute knowledge? Or what if you want to make Wonderus available to your team from the web without Slack? From the Wonderus Team Settings page, you can send email invites to additional Team Members. 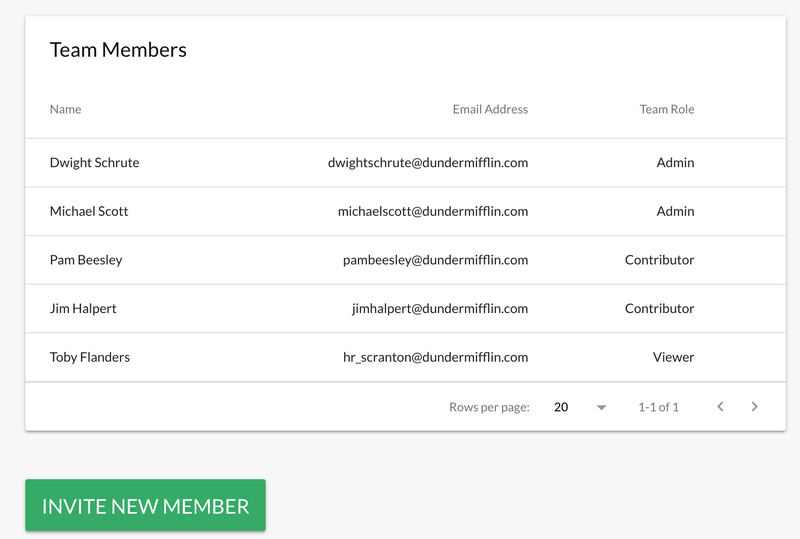 You can also select the user’s role on your team. Any Contributors will be able to create and edit Knowledge Cards as well as answer team questions. Any Viewers will be able to search and view knowledge as well as ask questions. With Wonderus has your new home for team knowledge, you’ll never worry about your team questioning the meaning of jargon again! And Wonderus as an acronym and jargon decoder is just the start, you can create Knowledge Cards to hold all kinds of team knowledge. Want to learn more? Sign up for Wonderus here or reach out on Twitter!